Vanadium pentoxide thin films result to be brown/yellow when oxidised and quite weakly coloured (blue), when reduced. Vanadium pentoxide thin films result to be brown/yellow when oxidised and quite weakly coloured (blue), when reduced. The principal vanadium oxide species are VO, V2O3 VO2, V2O5; however, due to the presence of oxygen vacancy defects some mixed valence oxide are known such as V6O13 with V+5 and V+4 oxidized states. If the number of the oxygen vacancy defects increases above a certain value the vacancies tend to correlate and to form the crystallographic shear planes. 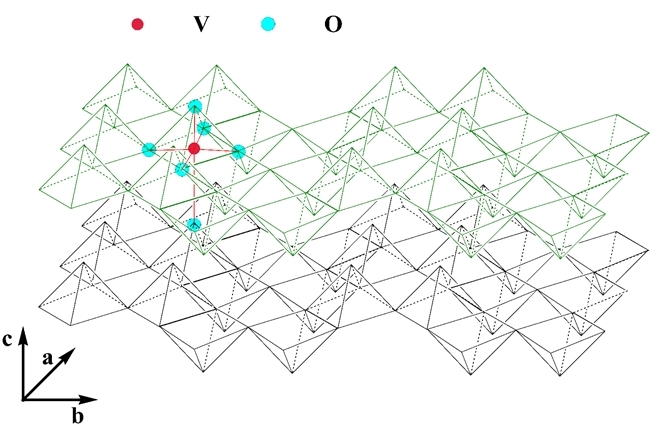 The vacancies are associated along a lattice plane and subsequently eliminated by the reorganization of V-O coordination units; the resulted oxides can be described by VnO2n-1 (Magneli phases) or by V2nO5n-2 (Wadsley phases). The V2O5 structure can be approximated by zigzag ribbons made with square pyramidal units of VO5 which share the edge: thus double chains are built, connected by their corners along the b-direction. The obtained layered structure is developed along the c-direction and the vanadium atoms are enclosed in octahedra units of VO6 distorted with three principal V-O distances: 1.58 Å (vanadyl oxygen along c direction), 1.77-2.02 Å bridging oxygens in the basal plane) and 2.79 Å (weak bond in between the layers). The vanadium pentoxide layered structure is a quite important host network for ions intercalation/deintercalation and huge literature can be found on that, especially regarding proton and lithium ions, because great interest has been focused on it for batteries applications. The colour, as well as for tungsten trioxide, depends by the amount of ions intercalated and by the deposition technique employed to obtaining the films: i.e for evaporated films, the starting colour is blue green at low x value, pass to dark-blue and become black as the x value increases while for sputtered films the colour change from purple to grey. However, thin films of thickness below certain values results colourless between brown and pale blue states. The modifications to the absorption spectrum that occur after the reduction of the films are quite relevant: the yellow colour begin to be fully removed and a broad and weak band centred at 1100 nm grow up (near IR region) and the border of the optical band is shifted to high energy also for low values of x.